EsTong baby Sleepbag wearable blanket: The Safer Way to Sleep The EsTong SleepBag wearable blanket replaces loose blankets in the crib that can cover your baby's face and interfere with breathing. In addition to helping your baby sleep safer, The EsTong SleepBag wearable blanket helps your baby sleep better, too. It is a warm blanket they cannot kick off; ensuring baby sleeps soundly throughout the night. Small is suitable for babies 0-22 months and 8-22lb. Medium is suitable for babies 15-42 months and 22-33 lb. Large is suitable for babies 42-72 months and 33-50 lb. 100% Natural, made of premium luxuriously-soft hypo-allergenic Cotton; Machine-washable. Optimal regulates body temperature so it can be used in all 4 seasons. Available in three sizes: Small is suitable for babies 0-22 months and 8-22lb. Medium is suitable for babies 15-42 months and 22-33 lb. Large is suitable for babies 42-72 months and 33-50 lb. 100% high quality cotton, super soft comfortable give a wonderful sleep condition, keep warm but not over-heated. Replaces loose blankets for comfy fit from the crib. 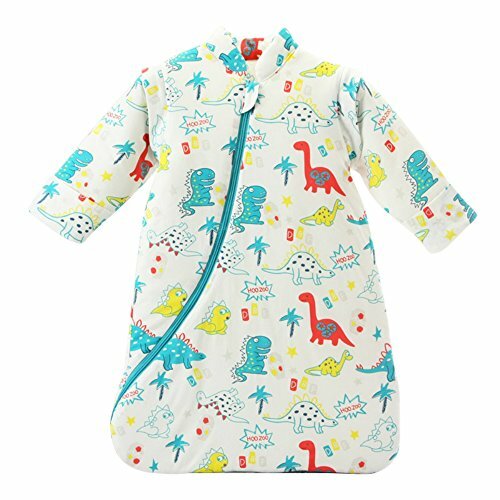 Perfect sleep bag design with a zipper from top and bottom for easy dressing and quick diaper changes, allows room for kicking while keep warm whole night. It designed to wear over pajamas or with just a diaper has detachable sleeve and an oversized side zipper which makes it easy to place baby in and out of the sleep bag.